Spirituality as a sixth sense. In Central Mexico the congregation is characterized by a lively ecclesiastical reality. The CFIC opened its first home in 2003 in the city of Merida, devoting themselves to pastoral work in the parish and in the world of health. The entry into the community of the first local religious leaders and the willingness of the local population laid the foundation fpr a very significant development in key areas of the Congregation’s charisma. The religious community is characterized by its multicultural identity. 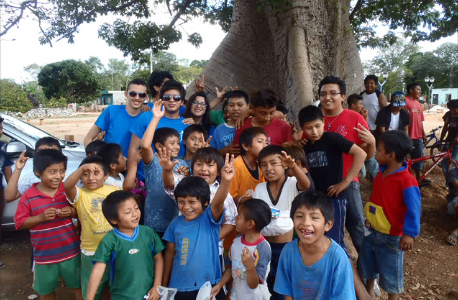 Mexico boasts an active youth organization focused on building more values that will lead to continued growth, with the help of Mary, Jesus and Father Monti, forging youth with a deep love for the needs of others and able to contribute to the development of their environment. The group supports the community in altruistic activities, becoming sensitive to current problems and instilling Catholic values. They orient, since their identity is one of young Catholics, for Catholic Youth everywhere to live with hope, commitment and love. They participate in common activities, such as visits to hospitals and orphanages.